UNITED NATIONS, July 5 -- Two Central American figures, each with problems with public disclosure of their budgets and spending, sped toward Tegucigalpa on Sunday. 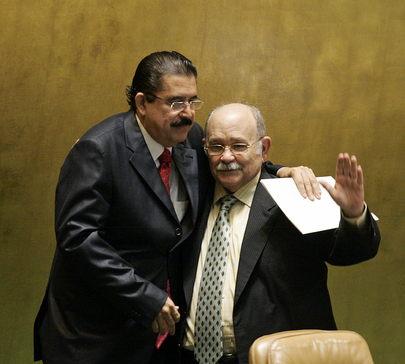 Manuel Zelaya, ousted as Honduras' president after among other things failing to file the required budget in September 2008, was joined only by this year's President of the UN General Assembly Miguel d'Escoto Brockmann, who used UN funds to hire two relatives and then refused to answer questions about it. Click here for Inner City Press' story on the matter. Ecuador's President Correa and thers who'd said they would join the quixotic flight went instead to El Salvador to wait to see what happened in the skies over Tegucigalpa. These more cautious leaders flew of the Argentine President's plane, Tango One. But it was difficult to determine on what plane the budgeting challenged duo was flying. One wag dubbed it "Loco One, the airline without budget." Who would rent or give a plane for such a venture? Since d'Escoto Brockmann's spokesman Enrique Yeves pointedly refused to answer any question about budgets or spending on or since June 29, it is impossible to shoot down rumors, probably false, that a UN plane was involved. Venezuela's Hugo Chavez, meanwhile, notably said that UN peacekeepers should get involved in returning Zelaya to power. Honduras was raised in the UN Security Council on the morning of July 2, albeit only as a briefing by Mexican Ambassador Claude Heller in a consultation on the Council's program of work for July. Sources in the closed door meeting told Inner City Press that Heller said that the Organization of American States process would have to play out first. The OAS Secretary General was among those who changed his destination from Tegucigalpa to San Salvador in light of the orders of Roberto Micheletti to stop any attempted landing. The applicability of international (and UN) law and rules regarding flights was also in question at Press time. Watch this site. UNITED NATIONS, July 1 -- With Manuel Zelaya's planned return to Honduras delayed at least two day to Saturday, at the UN on July 1 the question arose of who the UN recognizes as the current head of state. 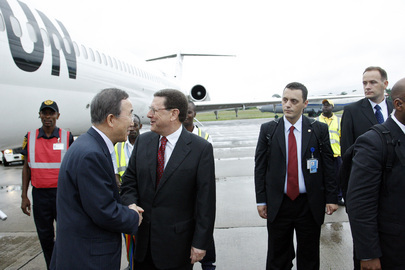 Secretary General Ban Ki-moon's spokesperson Michele Montas was first asked about Iraq, whether Ban has written to Ahmadinejad to "congratulate" him on his election. Ms. Montas said not yet, but he will at the end of July when this term term begins. "We congratulate a government when it comes into place," she said. Who is the head of state is a "matter for the country to decide." But in Honduras, the Supreme Court has ruled that the ouster of Zelaya was legal. Montas recalled that Ban "asked for a return to the Constitutional order." Video here, from Minute 18:34. A country's Supreme Court enunciates its Constitution. In fact, to some it seems that the test Ban's UN applies to "who is the leader" is the finger in the wind test or, more specifically this year, the follow Barack Obama test. In the real world of diplomacy, the Permanent Representative to the UN of one of the Security Council's five Permanent Members on July 1 told the press of "skepticism" about Zelaya being able to return. Reportedly, he was to fly from Washington, accompanied by General Assembly President Miguel d'Escoto Brockmann, to a U.S. base to pick up Ecuador's President Correa and, some said, some U.S. soldiers, and thence on to Honduras. The idea was that he would serve out his term and then return to his "ranch" - his money comes from timber exploitation. One wag joked that while the U.S. would like to use economic sanctions as a tool to pressure the current government to let Zelaya back in, his role in hardwood would make sanctions somehow ironic. The World Bank has put loans on hold. 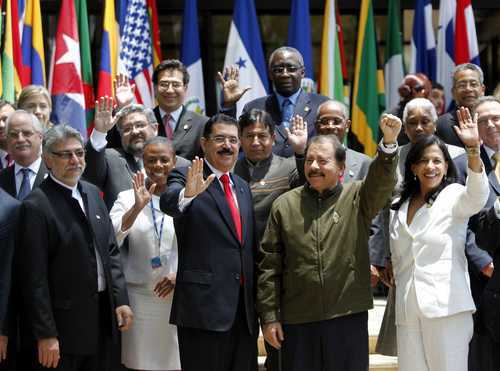 On July 1, the Inter-American Development Bank announced it will not be providing any new credit to Honduras. Obama has proposed over $60 million in development and military aid. Inner City Press would have asked about it on June 30, but d'Escoto Brockmann's spokesman Enrique Yeves did not allow the question. Strangely, while Yeves' job is ostensible to report about the General Assembly, and not Central American politics, he has yet to come and brief the Press about the over $8 billion peacekeeping budgets adopted Monday by the General Assembly. 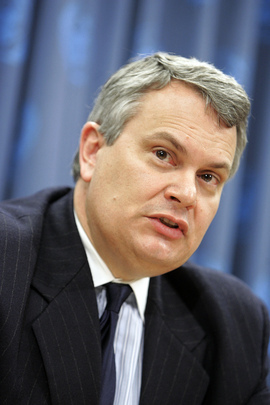 Could it be that in trying to avoid questions about d'Escoto Brockmann using smaller amounts of UN funds to hire two relatives, basic timely disclosure is now lacking about $8 billion in new spending? Watch this site.